For my birthday this year I got a gift certificate to take a cooking class at Sur La Table in Hell’s Kitchen, NYC. I looked at the schedule and the One Pot Dinners presented by Food & Wine Magazine sounded like an awesome class plus it came with a one year subscription to Food & Wine magazine. The class started at 11:00 am in the studio kitchen in the store. We were greeted by our instructor Giselle and her assistants, who grabbed us a cup of coffee. Giselle told us a bit about herself and how she went to culinary school and how when she’s not teaching she is a pastry chef at Momofoku Milk Bar. After she explained how the class worked and gave us a packet with the recipes we’d be making in class. 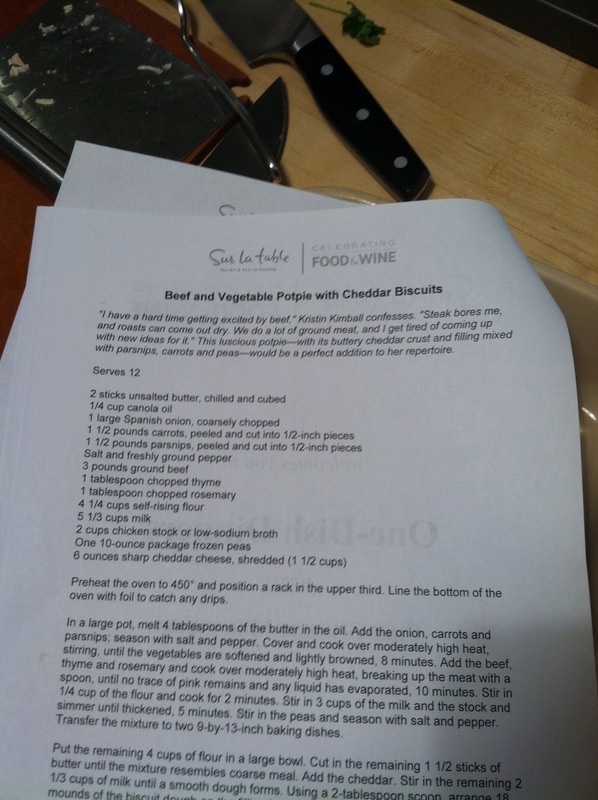 My favorite recipe we made. We started the class making an easy Mexican Chicken Pozole Verde. Giselle would show us how to do each step and assist us along with the help of her assistants. It was a great class and each team worked together really well. After the Pozole, we made my personal favorite– Beef & Vegetable Potpie with Cheddar Biscuits, followed by Rice Pilaf with Chorizo, Olives & Fennel, and last, Smoky Paella with Shrimp & Squid. We took a little break while some of the entrees cooked and had a tour of the store with our instructor Giselle. She told us what she recommended we purchase and what was used during class. We could also buy what we wanted then, but most of us waited until class ended. 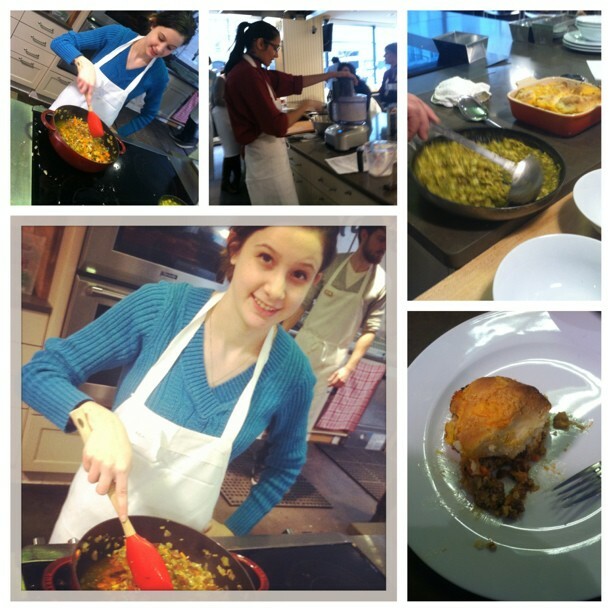 After our little tour, we came back to class and finished preparing then eating all the dishes. As I mentioned, my favorite was Beef & Vegetable Potpie with Cheddar Biscuits, it was delicious and perfect for a meal. It’s definitely a dish I’d love to conquer myself one night! If you ever decide to take a class at Sur La Table, a huge plus is that all students receive a 10% off coupon that is good for a week. Since I still had money on my gift card, it definitely gave me an upper hand. I decided to purchase my very own food processor and scraper to add to my kitchen collection. I’d highly recommend a cooking class at Sur La Table to any beginner in the kitchen, they really help you out and all the dishes are pretty easy. They have many cooking studio locations throughout New York and New Jersey and have a huge roster of classes, you can see, here. They also aren’t costly and range between $55-99 which is not bad for a professional cooking class. Plan on taking a class at Sur La Table? Let me know what you thoughts here or tweet me @smchickbigdeals! This entry was posted in cooking, Kitchen Gadgets, New York, New York City, nyc, Sara Monica, SCBD, SCBD Favorite, Small Chick Big Deals and tagged cooking class, food and wine magazine, hells kitchen, kitchen gadgets, new york, nyc, one pot dinners, sara monica, scbd, shopping, small chick big deals, sur la table by smallchickbigdeals. Bookmark the permalink.